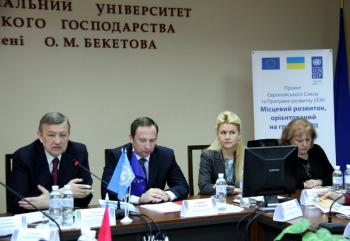 In Kharkiv 8 October 2014 the Third phase of the EU / UNDP Community-Based Approach to Local Development (CBA) Project was launched today in oblast with regional and local authorities, civil society organizations, private sector companies and the media. During the regional seminar participants discussed perspectives for further cooperation for promoting community-led activities to improve the living conditions of people in Kharkiv oblast. Distinguished attendees included the First Deputy Head of Oblast State Administration Ihor Raynin, Head of Oblast Council Serhiy Chernov, Community development specialist of joint EU/UNDP Project “Community Based Approach” Olena Ruditch, leadership of rayon state administrations and rayon councils; and heads of village and city councils. “I would like to thank the team of UNDP, which has been working in Kharkiv oblast since 2008. Today the Third phase of the Project is being launched. In terms of the implementation of previous two phasesproactive communities in cooperation with local authorities have implemented 70 projects. What is most important that having implemented the first 2 phases we have learned to plan and prepare projects’ implementation. 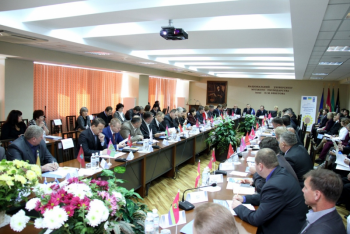 Initiative groups of local communities have learned to set up priorities, monitor implementation of the microprojects from on all stages”, - underlined in the welcoming speech Head of Oblast Council Serhiy Chernov.